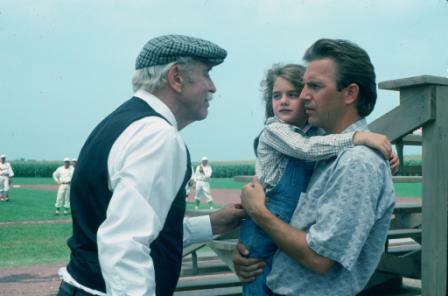 Burt Lancaster, Gaby Hoffmann and Kevin Costner in Field of Dreams (1989). Walking through Chisholm, Minnesota under glistening streetlights, Ray Kinsella, played by Kevin Costner, a middle-aged hippie on a mission, hikes right back into 1972 and catches up with Doc Graham. His rendezvous with Graham, played by grey eminence Burt Lancaster, is slightly surprising, because Costner and a traveling companion played by James Earl Jones have already verified that Graham died years before they arrived on the scene. Costner, however, is no longer a stranger to anachronism since pitching batting practice to the shade of Shoeless Joe Jackson on a diamond etched into the cornfields of his Iowa farm. His experience has made him into a missionary for baseball immortality. Whatever spirit or force brought back Shoeless Joe has also dispatched Costner through time and space to testify to an anonymous small-town doctor who once had ambitions to play for the New York Giants. Costner gets Doc Graham to describe his practically nonexistent big-league career, consisting of being dispatched by the legendary John McGraw to play the field in the last inning of a season-ending game. He never even got to bat. Costner assumes he’s been sent to bring Graham back to his ball field in Iowa, and begins to bait the hook by asking about Graham’s unfulfilled desire to compete with the big leaguers. Doc Graham looks him in the eye, asking, “And are you a man who could grant such a wish?” But it’s a rhetorical question, because Graham obviously lacks that wellspring of discontent Costner was expecting, so Costner primes it by saying, to come so close to your dream without ever realizing it, some men would call that a tragedy. That humorous line is the measure of a mature man. Doc Graham long ago laid down his selfish baseball dreams in favor of a “real job” that serves a community, and being faithful to his wife. Which ought to trouble Kevin Costner more than it seems to because so far in the movie choosing baseball has nearly destroyed his own livelihood and caused him to abandon his wife to their creditors and hostile relatives. Soon thereafter the scene ends without Doc Graham agreeing to come with Costner, who leaves, bewildered by this disappointing outcome. Yet when Costner and James Earl Jones resume their road trip the next day, the teenaged hitchhiker they pick up proves to be an aspiring minor leaguer named Archie Graham. It’s a mystery that seems to leave the past and present in a tangled knot. Assuming this turn of events represents God operating outside of time, what does the screenwriter intend for me to think about God’s nature? That he’s created a Heaven where virtuous people who have deferred their dreams are rewarded in the afterlife by having them fulfilled? Then does that imply that Doc Graham wasn’t truly fulfilled by the choices he made? Ah, wait, and the screenwriter will answer that question. Soon Archie Graham is in Iowa, ducking brushback pitches from one of the Chicago Black Sox, watched by Costner, his wife, his daughter. Also present is someone who is incapable of seeing these supernatural ballplayers, Costner’s brother-in-law. In fact, the brother-in-law is ranting about foreclosing on the farm, which has become a money-losing proposition ever since a chunk of it was plowed under the build the baseball diamond. There’s a ruckus, and Costner’s daughter falls off the home-made grandstand. She lies unconscious on the ground, not breathing. Costner’s wife is running to the phone in the farmhouse, but he shouts for her to stop. Time dilates as Costner waits to see if acting on intuition will save his daughter, or kill her. It’s a touching moment, if much more so for Costner’s character and for me, in the audience, than for Doc Graham, who seems well aware that he passed through this refiner’s fire once before. He knows he will always choose to be a servant, and be satisfied and fulfilled in making that choice. He is honored for that choice, as well, starting with all the resurrected ballplayers on that field in Iowa. And at that point a certain truth begins to dawn on Costner, and on me as I identify with his character, that questing all over the country has taught him to value what’s found in his very own backyard. The movie’s leitmotif question and answer – “Is this Heaven?” “No, it’s Iowa.” – ripples with possibilities. Does it merely typify the shallow expectation of “cultural Christians” that if you’re a good person you go to Heaven, which will be like a National Park populated by our ancestors? Or is it just as ignorant to suppose that Heaven will be someplace utterly supernatural and alien, rather than the perfected image of a place God has tried to teach us to live in all our lives? However, to obsess about the theological implications of Field of Dreams is to overlook its real message, compatible with nearly any religion – don’t wait til Heaven. Take advantage of our chance right now to live with people as God would have us do. The movie never fails to leave me bawling my eyes out for what I lost, and for what I never had. Very interesting commentary on one of my favorite films, Mike. Thanks for writing it. I’m feeling the urge to go and watch it again, now. 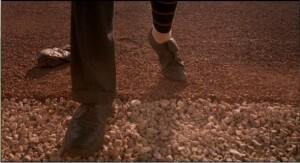 Shoeless Joe Jackson must be a veritable whirligig in his grave today. That’s a brilliant piece of writing; I have awarded it! That’s a brilliant piece of writing; I would have awarded it in any competition. Thank you! Sagan argued for the familiar. Eloquently, I think. Rick Wilbur (whose father was, I think, a major league catcher) was moved by the movie and called his dad afterwards. His siblings had called first. That’s beautiful and moving, Mike. Good post. I’m not sure that the movie (or book, for that matter) has anything to do with spirit, God or Christianity, but we’re all allowed to explore literature and film as we see fit. 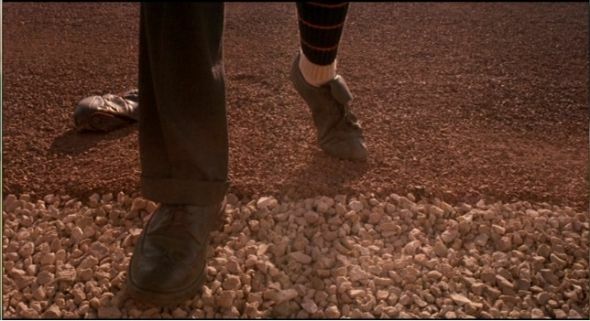 I prefer to look at Field of Dreams in a simpler fashion: Ray certainly stepped backwards through time in the same manner the baseball players came forward in time. Essentially, in 1972, Ray is a ghost (albeit a temporary ghost), who disappears from ’72 as easily and as quickly as he appeared on that 1972 street. He and James Earl Jones then pick up a “hitchhiking ghost.” It’s about the ghosts we carry with us–the things we haven’t done that haunt us. And the climax brings that interpretation home: it’s the ghost of his father who has been leading Ray all this time, fulfilling both Ray’s dream to play catch with his father and resolve their differences, and fulfilling his father’s dream of Shoeless Joe’s redemption. Great site, here–I’ve bookmarked and will come to 770 often.